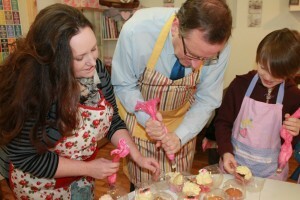 Phil Wilson, MP for Sedgefield, took part in a cupcake making workshop at Love Thy Cupcake in Newton Aycliffe as part of this year’s Small Business Saturday. Mr Wilson said: “It was an honour to get behind our areas local small shops and independent businesses on Small Business Saturday. We should do all we can to thank them for the vital contribution they make to the local economy, adding to the local community and boosting diversity on the High Street. "I have been working for a while on improving Aycliffe town centre and Love Thy Cupcake is the exact type of business we want to see more of in the centre, alongside the large chains." Saffron Broad is the owner of Love Thy Cupcake. She set up the business last year after leaving the corporate world to do something more creative. She said: “I was making cakes for friends and family and decided I wanted a career that made me and other people happy, so I left the corporate world and set up Love Thy Cupcake. Across the UK different activities took place to promote Britain’s small businesses. Shadow Business Secretary Chuka Umunna MP said: “Building on the success of last year, Small Business Saturday 2014 will help to provide a much-needed boost to our High Streets and make even more consumers aware of the fantastic products and services offered by small and independent businesses.